UTRGV track and field junior Anthony Magallon competes in the high jump during a meet earlier this season. EDINBURG — Anthony Magallon said he looked like a “shot dog” during his first warmup laps as a freshman walk-on at UTRGV in 2016. After three surgeries for injuries to his ankle, leg and back, Magallon could barely move for more than a year. He joined the track team at UTRGV for the chance to be a part of something, he said, but he couldn’t fully extend his leg during his first practices, and his back and core muscles were extremely weak. Magallon, a La Joya Palmview grad, said his recovery process was lengthy and challenging, but he managed to crack the travel team as a freshman. 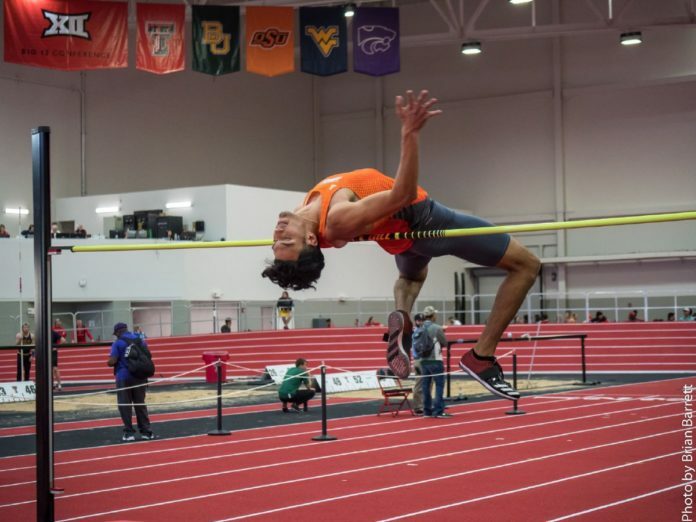 Now a junior, Magallon won a WAC indoor championship in the high jump this year and became one of just two UTRGV athletes to qualify for the NCAA Championships West Preliminary Round. He will compete in the first round of the high jump at 6 p.m. Saturday on the campus of Sacramento State University. Magallon was playing basketball for the Palmview Lobos high school team when a player fell on his leg. He broke his fibula and ripped apart the tendons in his ankle. He had surgery to insert screws in his ankle, leaving him on crutches for about six months and in a medical boot for another two months after that. When he started walking again, he quickly discovered that he was unable to stand up straight, suffering a herniated disk in his back after months of leaning on crutches. Back surgery put him out of action for about another six months. He couldn’t even sit for part of that period, having to either stand upright or lay flat on his back. Magallon said he trained with UTRGV for about five months before he started keeping up with his teammates in workouts. Even then, he still hadn’t returned to weight lifting. In December, UTRGV’s athletes began to compete to see who would qualify for the travel squad. Magallon began to compete on a partial scholarship as a sophomore, but his junior year brought a fresh set of challenges with a new coaching staff. New assistant coach Taylor Cipicchio said Magallon entered the fall “unknowledgeable of the event,” so she restructured his form. The biggest change, she said, was teaching him how to jump off the ground correctly by keeping him from arching his back too early. Cipicchio credited Magallon’s quick improvement to his work ethic. She said she often has to dial him back in training to ensure he’s getting adequate rest and recovery time. He won the WAC indoor title with a jump of 2.06 meters, then set a new career best at the UTSA Invitational in March, clearing 2.10 to tie for the third-best mark in program history. Cipicchio said the level of competition was a major factor pushing Magallon to his best jump at UTSA. She believes the talent at the NCAA regional meet could have the same impact. If nothing else, the experience is expected to help Magallon as he looks toward his senior season next year. He is seeded 46th out of 48 competitors, with the top 12 advancing to the finals on June 8 in Eugene, Oregon.